Have you ever wanted to know if there was a way to protect your entire home from EMF radiation? In this enormous guide, I’m going to tell you absolutely everything you need to know to protect your household. 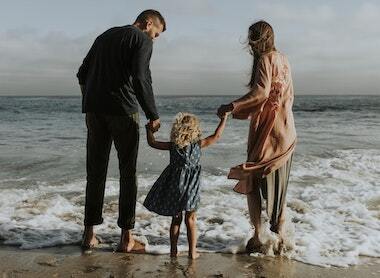 Whole house EMF protection requires a comprehensive approach and quite a bit of dedication, but we’re going to walk through it step by step together. Being the definitive guide on whole house EMF protection, this guide is quite long, so I put together a quick table of contents in case you want to skip down to a certain section. What Is Whole House EMF Protection? The unfortunate thing is, not that long ago we didn’t really have to worry about how much EMF radiation was making it into our homes. We didn’t worry about how much RF radiation was coming from cell towers, or how much dirty electricity we were sharing with our neighbors, or how much WiFi was pouring into our homes. Now, these are real dangers, and I hope that if you’re reading this post, you understand the dangers and health concerns that come with excessive exposure to EMF radiation. However, as technology continues it’s forever forward trend, these are becoming real concerns that we must address, which is a lot of what I’ve tried to do here at EMF Academy. I’m trying to share as much information as possible to help you keep yourself, and your family safe. So the idea of whole house EMF protection is trying to make at least one safe place that you can escape from the constant bath of radiation you get elsewhere in the world. Trying to reduce how much radiation is in your home, and importantly, trying to keep as much radiation out of your home as possible. After doing that, if you want to top it off with a device that claims to rid EMF radiation in your home, go ahead, it’s not going to hurt. Now throughout this guide, and it is quite long, I’ll be talking about tons of subjects, many of which I’ve covered extensively in other posts. For these topics, I’ll give you a brief guide, and maybe a recommendation or two, but then I’ll point you to those other guides. I’d encourage you to let them open up in another tab and maybe come back them later. First, just make it through this whole post, and then go back and read more about the topics you need more clarification on. Now, let’s get to the chapters. 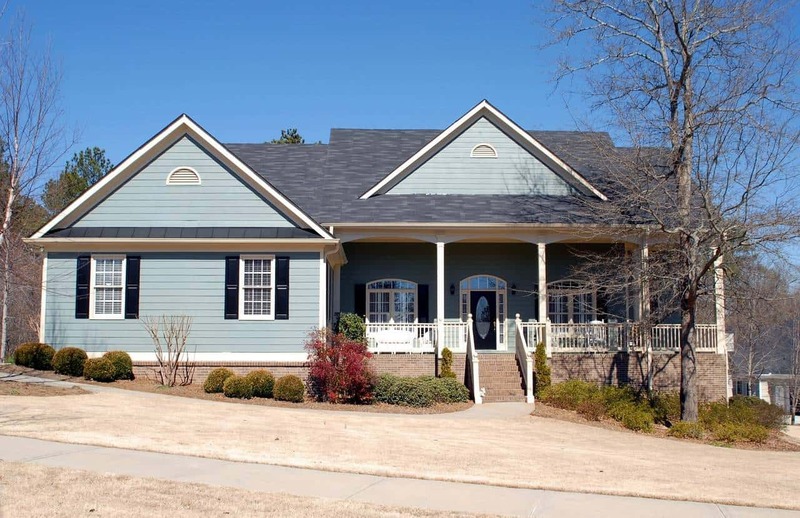 Since protecting your home has so many aspects, I want to cover each one individually, talk about why it’s important, and recommend products that can help. Let’s start with the space we spend most of our time, the bedroom. This is one of those chapters that I’m going to be a little bit brief on because I wrote up a long and popular guide called “How To Eliminate EMFs In The Bedroom” that you can check out for all the details. So for this section, I just want to tell you a little bit about why reducing EMF radiation in the bedroom is SO vital for whole house EMF protection, and then give you some of my favorite tips from that article. So let’s first talk about why it’s so important. Well, first of all, studies have long proven that the damage to our bodies, and to our DNA, from EMF radiation is cumulative. This means that the damage stacks up over time as we’re exposed. Since we spend about 1/3 of our lives in our beds, reducing the radiation our brains and bodies are exposed to during this time is extremely vital. On top of this, EMF radiation has been shown to reduce the quality, and quantity, of our sleep. In fact, a study conducted at the University of Melbourne proved that EMF radiation affects our sleep, but reducing our bodies ability to produce melatonin. Melatonin is the hormone that our bodies produce that regulates sleep. The reason this happens is that the electrical nature of EMF radiation causes our bodies to recognize it as light, as so our bodies are tricked into thinking it’s still daytime and doesn’t produce melatonin. So the bottom line is, making your bedroom a bit of an EMF sanctuary is a super important part of our whole house EMF protection plan. Here are summarized versions of some of my favorite tips from my post on reducing EMF radiation in the bedroom, (and the ones that I won’t be covering later on in this post). 1. Do SOMETHING about your cellphone – I hope that you know how dangerous the EMF radiation from your cell phone is, or at least have an understanding of how much radiation it produces. Suffice it to say, you don’t want to be sleeping right next to it. Unfortunately, at least in the United States, more than 50% of people sleep with their cell phone either under their pillow or on a nightstand next to their bed. Now I get it, many people use it for an alarm (see a better solution here), but it is absolutely not worth the risk. So I’ve broken down possible solutions to this problem into good/better/best options. Good option: Put your cellphone on airplane mode, and put it across the room. This will still allow it to function as an alarm but will reduce your exposure to its radiation to almost none. Better Option: Put your cellphone in the same place, but just turn it off and get a simple mechanical alarm clock like this one. Best Option: Just get in the habit of having your bedroom be a cellphone-free place, and don’t even bring it in. 2. Get Better Lighting – Get rid of the harsh lighting in your room, and certainly get rid of the compact fluorescent light bulbs. Not only are these lights shown to interrupt our sleep patterns, but they can also affect our health. On top of that CFLs is a major contributor to dirty electricity (which we’ll talk about in its own section down below). You’ll be much better off sticking to simple incandescent light bulbs. – I’ve written quite a few articles about how much ambient EMF radiation enters our home through dirty electricity, nearby power lines, smart meters, cell towers, and much more. Each one of these dangers has it’s own best defense strategies, many of which I’ll talk about down below. 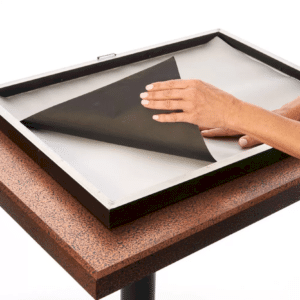 So to keep this tip brief, I just want to talk about one of the best things you can do for your bedroom, and that is getting a faraday canopy for your bed. Now, you could always protect your bedroom with an enormous amount of EMF protection paint, but this is extremely costly and comes with its own risks (many people do not properly ground, also it will not protect from radiation inside your home). 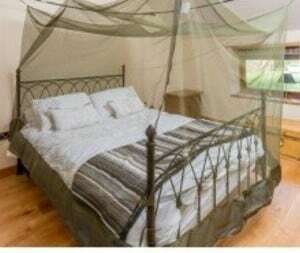 So the best option is to get a canopy for your bed. Now they are quite costly for the most part, but they do work extremely well. It is essentially just a large net made of a material that is capable of blocking radiation entirely. The way it accomplishes this is that it is made of a blocking metal, with holes smaller than the shortest wavelength of the radiation, thus keeping it out entirely. Many people report significantly improved sleep inside of an EMF protection canopy, and it eliminates having to do many of these other steps, as you’ll be almost entirely protected. My wife and I have this canopy that we picked up on Amazon, they also have ones for every size bed. No doubt that this is one of the absolute best things you can do to protect your body and your DNA from EMF radiation both in your home and outside of it. This one should be relatively self-explanatory, and again I have a huge guide on WiFi radiation, but the bottom line is, you should consider turning it off at night. The ideal solution would be not having WiFi, and hardwiring computer in your home, but for many people, the inconvenience of this is too great to bear, and I get it. 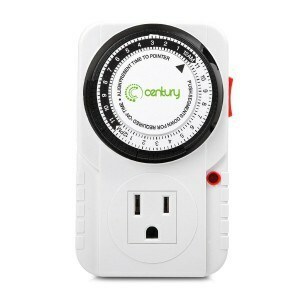 So, consider turning it off at night, either manually, or by getting this simple mechanical outlet timer. With the outlet timer, just set a time period, like 11 PM to 7 PM, and it will automatically disconnect, and reconnect, the router between these times. Ok, now let’s move outside the bedroom for a bit and continue on our Whole House EMF Protection guide. For more on how to reduce EMF radiation in your bedroom, check out my full guide. Let’s start by talking about Dirty Electricity. 11 Ways To Reduce Dirty Electricity Exposure. So for the purposes of my article on protecting your entire house from EMF radiation, I’ll keep this to more of a summary, and give some recommendations as to what you can do. First Of All, What Is Dirty Electricity? Dirty electricity, which you’ll sometimes see called things like dirty power, or electrical pollution, is essentially just unusable power that gets stuck in your wiring and radiates EMF radiation into your home. You see, the wiring in your house, and just about every building is either 50, or 60 hertz depending on where you live. When this wiring system was originally designed it worked well because nearly all electronics were designed to take a constant flow of this electricity. Dirty electricity starting being an issue when technology started to demand either more, or less, or different electricity than this wiring was intended to give. Using things like converters, electronics like dimmer switches, CFL lights, and just about any modern electronics started to alter the way they accept this electricity. This creates dirty electricity or technically speaking, high-frequency voltage transients, which sit in your lines and are not able to be used. This dirty electricity then radiates into your house, causing a noticeable, measurable, and dangerous amount of radiation all over your home. Luckily, a few solutions have been designed for this. There are some great solutions to dirty electricity in the form of dirty electricity filters that I talk about extensively in my guide to dirty electricity filters. So for this guide, I’m just going to talk briefly about how these filters work, and then give you a recommendation on which ones I like best. First of all, these filters essentially take the unusable dirty electricity in your lines and convert it back into the 50/60 hertz power that is intended to be in those electrical lines. They also filter out dirty electricity in the ranges of 4 to 150 Hz. Depending on which filter you get, they will likely use some form of frequency based pollution reducer to accomplish this, but regardless, they will dramatically reduce the dirty electricity in your home. To know if the filters are working, they also sell meters that measure dirty electricity. Ok, so there are basically two good companies that you can go with for dirty electricity filters, and that is Graham Stetzer or GreenWave. Both produce good quality products, and both are well reviewed. I personally like Greenwave’s technology slightly more, but you can’t go wrong with either. To purchase Graham Stetzer filters, go here. To purchase Greenwave Filters, go to the following links depending on what you’re looking for. Alright, now that we’ve talked about dirty electricity, let’s talk about what you can do to protect your home from ambient sources of EMF radiation, like cell towers and power lines. Primarily we’ll talk about options you have for protecting your walls, and protecting your windows. When you think of the outside of your house, there are basically two things you need to think about, the walls, and the windows. Let’s talk about each one a little bit, and what your options are. How can you protect the walls of your home from EMF Radiation? Well, you basically have one good option (and I would only recommend it on a situational basis) and that is EMF protection paint. Now, I would not suggest you go about painting your whole house with this stuff, in fact, that is likely to make things worse, not better if you don’t know what you’re doing. Where EMF paint comes in really handy is for protecting against certain dangers, like your smart meter, or an electrical panel, etc. It is good however to know that this kind of paint is an option, and for some purposes, it is really helpful. Now let’s talk a bit about what you can do for the windows. How to protect the windows of your house from EMF radiation. You basically have two options, window film, or EMF protection curtains or drapes. The advantage of this kind of film is that it protects all the time, whereas curtains only protect when they are closed. The downside is it does slightly obstruct or tint your view out the window. The concept is simple, it is essentially made out of a material that EMF radiation does not penetrate through. You can pick up the film on Amazon. This one, in particular, has a rating of 34 dB, meaning it blocks 99.94% of EMF radiation. Ok, now let’s talk about using curtains or drapes to protect your windows. Regardless of where you purchase them, they are likely to use one of two different materials, Naturell, or Daylite. Both of these do a good job blocking the radiation, protecting protection around 99%. You can either purchase the curtains or drapes already made, or you can buy the raw blocking material and make them yourself! To pick up the curtains, you can check out a listing here. Or, to just buy the material to make them yourself, check out this listing. Alright, now it’s time to talk about smart meters. I wrote one of the most comprehensive smart meter guides on the internet, so I won’t get too lengthy in this area. However, I do want to just briefly touch on what smart meters are, why you should be concerned, and a few strategies you can use to reduce the radiation (if you aren’t able to get rid of it). Ok, let’s start by talking about what smart meters are. Basically, smart meters are just the newer, upgraded, wireless version of the analog utility meter that you were probably used to. Remember when you were younger, and the utility company guy/gal would come to your house, and hop the back fence to read your meter? Well, that was because you had a simple analog meter, and that was the only way to get that reading. However, the utility companies got smarter and realized if they could have that information wireless transmitted to them, they could save a fortune by not employing people to go out and read those meters. On top of that, AMI (Advanced Metering Interface) meters, which is what most people refer to as “Smart Meters”, actually work both ways. This means not only do they receive information from the meter, but they can transmit commands BACK to the meter. This allows the utility companies to do things like remotely turning off your power/water/gas etc, as well as make firmware updates without having to send anyone out. This is all great for the utility company, but this is NOT great for you. 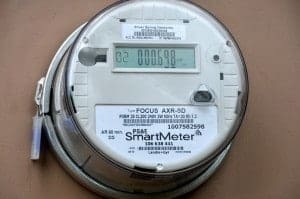 You see these smart meters emit an enormous amount of EMF radiation when they transmit that data to the utility company, and this doesn’t just happen once a month, they are transmitting constantly. If you have a bedroom or living space in the room opposite this smart meter, you can expect to get really high readings. Many people even live in apartments, and if you’re unlucky enough to be in the apartment that has a shared wall with an entire bank of smart meters, you can expect to exposed to even more EMF radiation. So, what can you do about your smart meter? You’ll have to check what your current state laws are about this issue because it is ever changing. What If You Can’t Opt Out? So if you can’t opt out, you have basically 3 good options, and I’ll put them here in order of how good they are (in my opinion). 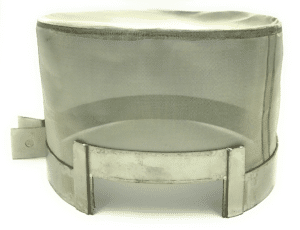 Smart Meter Cover – (You can pick one up here) I put this as the first option, because it is relatively inexpensive, and extremely simple compared to your other options. A smart meter guard is essentially a small faraday cage, that will block the majority of the EMF radiation coming from your smart meter. However, if you are trying to be thorough, you will want to combine this with the next option as well. EMF Protection Paint – (See my review here) I talked earlier about how EMF protection paint should probably be used situationally, and in my opinion, this would be that situation. This kind of paint block EMF radiation that is coming in a direct line, so it makes a perfect product to block radiation coming from a smart meter into your home. 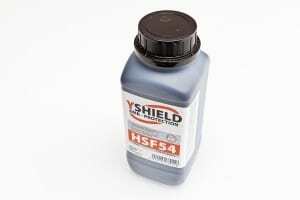 Make sure you check out my review or look it up yourself so that you are sure to apply and ground the paint properly. If you do have a smart meter, I’d encourage you to take a look at these products and to take a look at my complete smart meter guide. Alright now that we’ve covered some of the biggest threats for EMF radiation in your home, let’s talk a little bit about some of the other appliances. You might not be aware, but many of the appliances in your home actually emit a fairly large amount of EMF radiation. I’ve written posts on many of these appliances, so I don’t want to bog down this already long post with that information unless you are looking for it, so I’ll just link to those guides in this section, and if you’re interested you can check them out. Suffice it to say that the cumulative exposure from appliances in your home can actually be quite large, however, it should be less of a concern that things like smart meters, cell towers, WiFi etc. Also, are you worried about the electrical panel in your home? I wrote up a fantastic guide on this issue that you can check out here. Next, I think we should talk briefly about why having an EMF meter is SO important to your whole house EMF protection plan. Having a quality EMF meter is one of the absolute most important things you can do if you care about the dangers of EMF radiation. 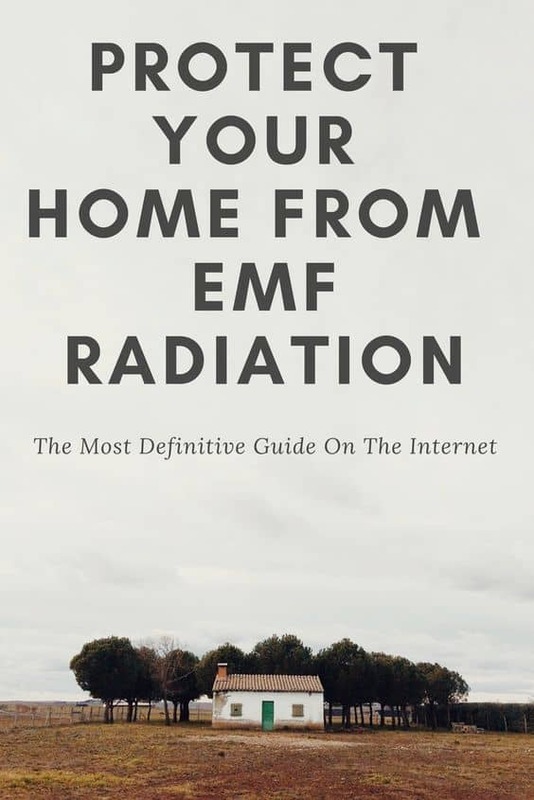 Not only does it allow you to gain a better understanding of the amount, and kind, of EMF radiation in your home, but it also helps you to eliminate it. It helps you to eliminate it by allowing you to know if the home protection steps you are implementing are actually working. As an example, you get a smart meter guard to help protect you from the EMF radiation coming from your smart meter; without an EMF meter, you won’t know how well that solution worked for your home. This applies to just about any solution you apply, or product you purchase. An EMF meter also allows you to compare products such as cell phone protection cases, or laptop shields, etc. as to how well they work. The bottom line is having a quality EMF meter is one of the absolute best things you can do to protect your home from EMF radiation because it gives you the information you actually need to make positive changes. What Is The Best EMF Meter For Me? There are quite a few good quality EMF meters out there, but I don’t want to bog you down with all of them and their differences, so I’ll just mention my two favorites, one being more expensive, and one being a good budget option. My favorite EMF meter at the moment is the new Trifield TF2 (read my full review). 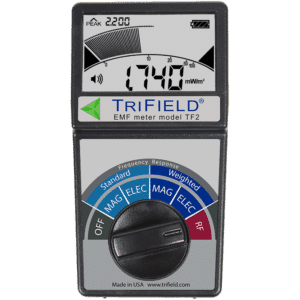 Trifield has made quality EMF meters for a very long time, and have been a standard in the industry for good reason. One of the main reasons I like the Trifield so much is that it measures all three types of EMF radiation: magnetic, electric, and radio frequency. It is also simple to operate, quite accurate, and just an overall great quality EMF meter. If you’re on a budget, my favorite low-cost EMF meter at the moment has to be the Meterk (read my full review). The biggest downside of this EMF meter is that it does not read radio frequency radiation, just electric and magnetic. 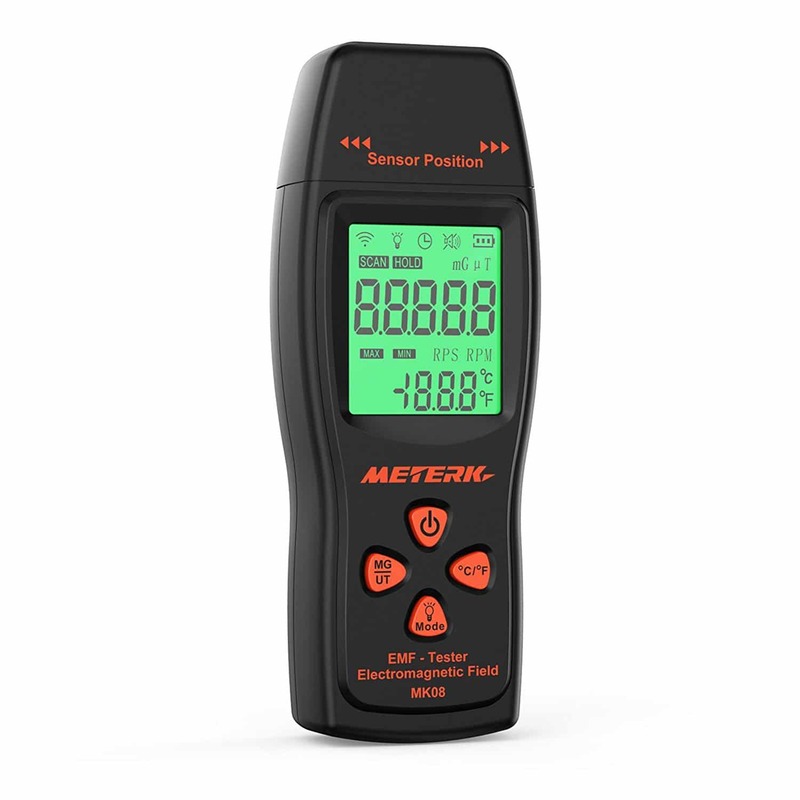 Other than that, the Meterk is probably the best EMF meter you can get for really inexpensive. I have the meterk, and because it’s so small and lightweight, I still find myself using it fairly often. Regardless of whether you get one of these EMF meters, or another quality one (Cornet makes some good EMF meters as well), just make sure that you have one, as it will be your best tool at fighting the dangers of EMF radiation, and you’ll be surprised how often you’ll use it! Alright, we’re exactly 4000 words into this enormous guide, and I’m just now getting to talking about whole house neutralizing products, and that is for a reason. Although some of these products certainly might work, I think it’s always a better idea to start with doing smart things to reduce the radiation in your home, before you consider a fix-all product. So I wanted to guide you through some of those steps first. However, now it’s time to start talking about some of the products that are out there. I am not necessarily endorsing all of these products, but I do want to give you a full view of what products are out there that are intended to protect your home from EMF radiation. These products are also not ranked, it is just a list of some of the products available to you. See the product listing here. Aulterra makes a number of EMF protection products, with their most popular being their whole house plug, and neutralizer sticker for cell phones. I wrote up a huge review of Aulterra that covers the company, the founder, and reviews all of their products if you’d like to read that, but for the sake of this guide, i’m just going to talk a little bit about their whole house plug. Overall, I think this is actually a fairly good product. There are a few whole house plugs on the market, and if I were going to use one this might be it. The biggest reason is Aulterra’s transparency as a company. They have a full page of research on their website, openly publish their patent, and are all around fairly transparent about how their products work. That being said, most of the research they have had done is not on the plug, but on the neutralizer sticker, so keep that in mind. So how does the Aulterra Whole House Plug work? Well, the product itself is very simple. It is a small gray plug, that you plug directly into the wall, and it is supposed to retune the wiring of the home to provide a neutralizing effect to EMF radiation. I followed up on this, and because the product is intended to neutralize (or change the waveform of) EMF radiation, this change can not be measured by an EMF meter, which is disheartening, but I can understand it. Aulterra told me that the whole house plug accomplishes its protection with a compound of paramagnetic minerals that are inside the plug. 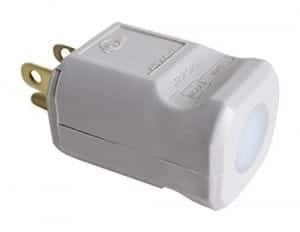 The plug is supposed to reduce the EMF radiation of all the electronics in your home that are plugged into the wall, and also help keep ambient EMF radiation out of the home. What I like about this plug is that it is simple to use, inexpensive, and is supposed to help protect you from a large amount of radiation. However, I do not like that this is not easy to test or understand if it is working. This is a perfect example of a product that could help enormously, but also points out to me why doing the other things in this guide first is so important. The Elink whole house plug is almost exactly identical to the Aulterra plug, but I trust it a bit less and I’ll tell you why. First of all, if you want to read a ton about all of Elinks products, and why I doubt their claims a bit, feel free to check out my full Elink review. Now I have a bit of a background in computers and technology, so I can tell you that this tells us basically nothing about how the product works (in my opinion). Other than this statement, there is very little information about the product and how it works. However it seems to be modeled after the Aulterra whole house plug, so I’d imagine it works very similar. 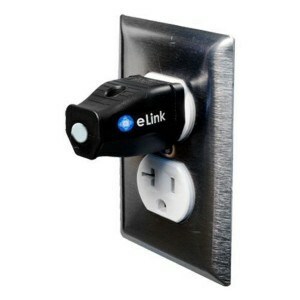 I don’t want to say that the Elink EMF house plug doesn’t work, because I don’t know that, I’d just say because of the lack of information and research, I personally would have less trust in it. 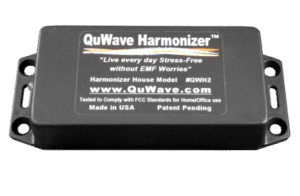 The QuWave Home Harmonizer is an interesting product, and I wanted to cover it because it is fairly popular. It is definitely a premium product, as it is quite expensive in comparison to many of these home products (but perhaps it’s worth it). One of the interesting things about the QuWave home product is how they describe the protection, calling it a “cocoon that protects you from external negative forces.” They say it does this by generating a field that replicates the Schumann Resonance field and that this allows your body to get back to it’s most natural state. Getting back to your natural state then allows you to feel increased energy, metabolism, well being, etc. They also say that the QuWave home harmonizer generates an energy field which intuitively envelops and protects any object within its range. QuWave says that the best way to use the product is to put it in a room that either has a high amount of EMF radiating sources or a place where people spend much of their time like the bedroom (interestingly, they also say that for maximum protection you should have one in each room, which for many people would be prohibitively expensive). They say that the range is approximately 40 feet, but that the closer you are to the unit, the more you will be protected. I can’t really give a great opinion on this product because I just simply don’t know enough about it. The QuWave website does have a good amount of information and I’d encourage you to check it out if you’re interested in this product. There are dozens of more products out there claiming to provide some EMF protection to your home, so if there are others you’d like me to add, or cover in this article, comment below or send me an email and I’ll do so! If you made it to the bottom of this article, I commend you, as this was a beast of a post. However, I felt like it was important enough of a topic to really take my time and provide the maximum amount of information to you. The bottom line is, I’m here to help, so if you read this and felt like ANYTHING was lacking, or just want help or clarification, feel free to email me personally, or comment below, and I promise I’ll respond to you: [email protected]. In the end, I think if you’re looking to protect your home from Electromagnetic radiation, you need to start with the basics, like looking at your use of electronics, protecting from your smart meter, getting rid of your WiFi, and the rest of the things I talk about in this article. If after you’ve done all those things, you want to get a product to help further than go for it. I just don’t want you to trust you, or your families, health with a single product without first putting the time in to do the simple things that we know work. I truly hope you enjoyed this post, if you did, do me a favor and consider sharing it!